WASHINGTON: Patients receiving the Absorb everolimus-eluting bioresorbable vascular scaffold (BVS), a dissolving stent to open clogged vessels around the heart, showed outcomes comparable with patients receiving the Xience drug-eluting metal stent between years one and two. However, patients receiving Absorb BVS faced an overall elevated risk of adverse outcomes at two years compared with patients receiving metal stents, a difference that appears to be attributable to the stent being placed in vessels that were smaller than recommended, according to a study presented at the American College of Cardiology’s 66th Annual Scientific Session. Current U.S. Food and Drug Administration (FDA) instructions for the Absorb BVS recommend avoiding its use in small vessels; the study was conducted before this guidance and updated implantation techniques were in place. Previously-reported year one results showed Absorb BVS to be non-inferior to metal stents in terms of the trial’s primary endpoint—target lesion failure as measured by a composite of cardiac death, target lesion heart attack and ischemia-driven target lesion revascularization at one year. The new results show that non-inferiority was retained for the span between years one and two, but that at the end of year two patients receiving Absorb BVS showed a significantly higher risk of target lesion failure. However, inconsistencies with regard to adherence to study protocols and the procedural techniques used to place the device appear to account for some adverse outcomes, researchers said. They report sub-analyses suggesting that proper use and placement of the device reduces the differences in outcomes between Absorb BVS and the metal stent at two years to a non-significant level. “These results show that this device is generally comparable with the drug-eluting metal stent when the device is placed in appropriately-sized vessels and placed using appropriate procedural techniques,” Ellis said. 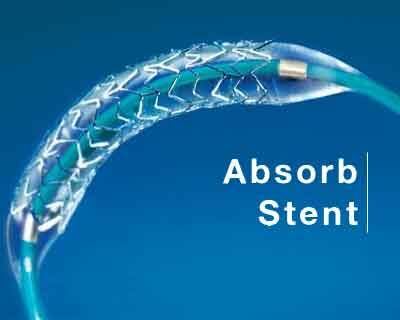 Stents are used to open vessels that have become clogged with plaque, allowing blood to flow freely. The trial is the largest to assess long-term outcomes from the Absorb BVS, which is the first stent designed to fully dissolve after being placed in a heart vessel. The researchers cautioned that, although they offer important insights, the trial’s two-year results cannot definitively show whether the dissolving scaffold reduces long-term adverse events compared with a permanent metal stent because the scaffold is not yet fully dissolved in most patients until year three. “The value proposition of the Absorb BVS is that once the device is fully dissolved after three years there will be better long-term outcomes, but there are as of yet no long-term, large studies available to show that,” Ellis said. The trial, called ABSORB III, enrolled 2,008 patients treated at 193 centers, primarily in the United States. Patients had up to two areas of significant plaque buildup in separate vessels and were randomized to receive either the Absorb BVS (1,322 patients) or the Xience stent (686 patients). Both stents gradually release everolimus, a drug to prevent tissue from growing within the stent. Between years one and two, target lesion failure occurred in 3.7 percent of patients receiving Absorb BVS and 2.6 percent of patients receiving the Xience stent, a difference that was not statistically significant. At the end of two years, target lesion failure had occurred in a significantly greater proportion of patients receiving Absorb BVS (10.9 percent) than patients receiving Xience (7.8 percent). This difference was largely driven by target vessel heart attack, which occurred in 7.3 percent of patients receiving Absorb BVS and 4.9 percent of patients receiving Xience. The risks of cardiac death, ischemia-driven target vessel revascularization and development of blood clots (thrombosis) around the stent were not significantly different between the two study arms. The trial’s protocols specified that only vessels 2.5-3.75 millimeters in diameter should be included in the study. However, the protocols allowed clinicians to assess vessel size based on visual assessment from a coronary angiogram, which is less precise than a method known as quantitative coronary analysis. As a result, 19 percent of patients included in the trial received treatment for vessels that were smaller than is currently recommended (less than 2.25 millimeters as measured by quantitative coronary analysis, which equates to roughly 2.5 millimeters as assessed visually). These patients had significantly poorer outcomes than those whose treated vessels were at least 2.5 millimeters in diameter, and a sub-analysis excluding these patients showed Absorb BVS to be no longer significantly worse than metal stents at two years in terms of target lesion failure. In addition, the original study protocols did not specify the use of certain procedural techniques that have since been shown to improve outcomes with the Absorb BVS. A separate trial, ABSORB IV, is currently enrolling patients for further insights on outcomes from the use of Absorb BVS. A preliminary analysis from Absorb IV, which includes refined procedural techniques and stricter adherence to recommendations with regard to vessel size, suggests proper use and placement of the Absorb BVS may be associated with a considerable reduction in risk. In collaboration with FDA, a landmark analysis combining Absorb III and Absorb IV has been extended to further evaluate the effectiveness and short- and long-term benefits of Absorb BVS. The landmark analysis will start three years after device implantation, when the BVS is expected to be fully absorbed, and will follow patients for an additional four to seven years. ABSORB III is funded by Abbott Laboratories.